Gruen was a watchmaking company based in America. It is very well known in America, but virtually unknown outside of the USA. As far as I can make out, Gruen mainly imported movements from Germany and Switzerland and had only limited capability within the USA for making or finishing movements. Imported movements were adjusted, dialled and cased in the US and sold in a wide variety of case styles and prices. The first Gruen company was founded in 1874 in Columbus, Ohio, by Dietrich Gruen, who had been born and apprenticed in Germany and then worked in Switzerland for three years before moving to America. This first company was liquidated in 1894 and Dietrich Gruen founded a new company with his son Frederick Gruen. A second son George joined in 1897, and in 1898 the company moved to Cincinnati. Gruen had a long time connection with Biel / Bienne. The first company, founded by Dietrich, imported movements from Madretsch, a suburb of Biel / Bienne, and it appears that the later companies continued this practice. In 1903 a Swiss subsidiary company, The Gruen Watch Manufacturing Company, was formed, located in Biel / Bienne. It appears that to start with this subsidiary simply purchased movements from local manufacturers, and then around 1910 a small factory was set up in Biel / Bienne and Gruen began to manufacture some movements of their own. In 1917 the Gruen company built a new factory on the outskirts of Cincinanti at Time Hill. The building was loosely modelled on a medieval guild hall, and the company adopted the name "The Gruen Watchmakers Guild", invoking an idea of a tradition of a medieval guild and a noble craft of watchmaking. In the 1920s Frederick Gruen said “It has always been our aim ... to foster those ideals of the ancient guilds, of quality and craftsmanship; to make useful things in a beautiful way, under ideal surroundings." At some time after 1920 (different reports say 1921, 1922, and 1923) a new factory was built in Switzerland at Biel / Bienne called the "Gruen Precision Factory" or "Precision Workshop". The highest quality movements that Gruen sold were produced in the Precision Factory, and Gruen watches containing these were marked "Precision". Lower quality movements continued to be bought in from outside firms, but this was run down as Gruen in-house manufacturing increased. By the late 1930s Gruen were making all their own movements at the Precision Factory. Gruen made both men's and women's wristwatches starting in 1908, but these proved popular only with women. Like the others mentioned here, Gruen was one of the few companies to take wristwatches seriously this early, seeing their potential despite disappointing early sales to men. Gruen made both wrist and pocket watches for the military during World War One. Most had silver cases, which would tarnish but would not corrode under the conditions in the trenches. To meet U.S. military regulations these had luminous dial markings and hands. 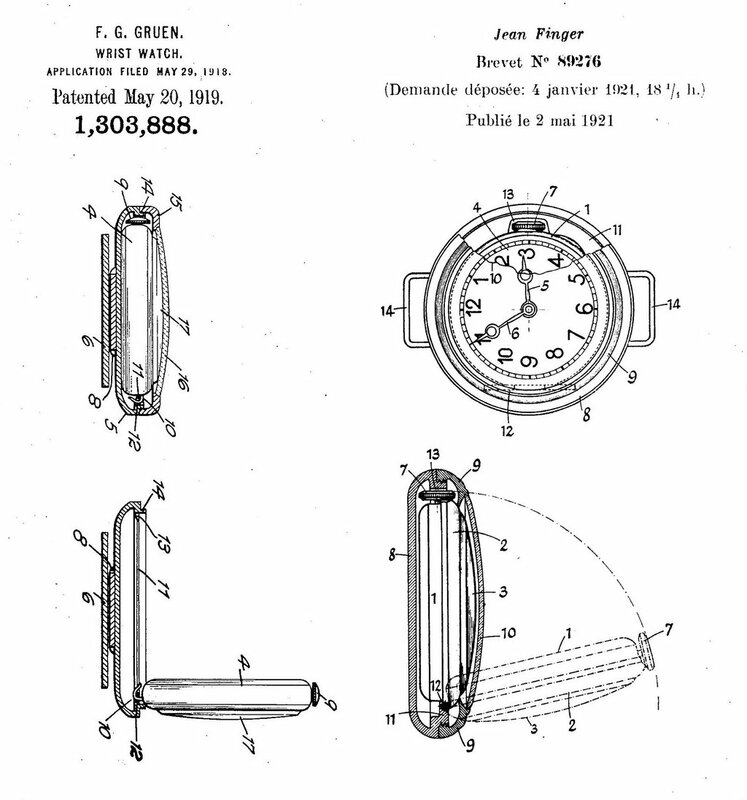 By 1918 Gruen were making a "Moisture Proof Military Wrist Watch" under US patent 1,303,888 registered by Frederick Gruen on May 29, 1819. The watch was contained inside an outer case, which had a screw-on bezel with crystal, but no crown, and hence no hole for the winding stem. The drawback was, of course, that every day the owner had to unscrew the bezel, flip the watch from its outer case and wind it up, being careful not to lose the loose bezel in the process. And the same procedure was necessary to set the time. A picture of this watch can be seen at 1908: Gruen Wristwatches. This is part of a fantastic history of the Gruen Watch Company written by Paul Schliesser. The 1918 Gruen design is exactly the same design as the "Hermetic" case supplied to Rolex and others under a 1921 Swiss patent number CH 89276 registered by Jean Finger. A comparison of the two patents can be seen in the picture, and you can see how similar they are. Did Finger copy Gruen's patent? It would appear so. The principal difference between the two patents is that in the Gruen patent the watch is held to the outer case by a hook and can be easily removed, the watch in the Finger patent is hinged to the case and the hinge pin must be removed if the movement is to be freed from the outer case, this makes it more secure in everyday use and less likely to be dropped. When Hans Wilsdorf and his brother-in-law Alfred Davis founded the firm of Wilsdorf & Davis in London, at first they imported watches from a variety of Swiss manufacturers. When Wilsdorf decided that he wanted a good quality small movement watch to sell as a wristwatch he formed a relationship with the firm of Jean Aegler in Biel/Bienne. Business between Rolex and Aegler flourished until by 1920 Rolex was Aegler’s largest customer. The post war slump must have hit even Rolex's business hard, and Hermann Aegler invested in the survival of his largest customer by purchasing 6,960 shares and was appointed to the board. The second largest customer of Aegler was the US firm Gruen. As business recovered after the post-war slump both Rolex and Gruen became large shareholders in Aegler. The trading name of the Aegler company became "Aegler, S.A., Fabrique des Montres Rolex & Gruen Guild A". Both Gruen and Rolex showed pictures of the Aegler factory in their advertising, each with their own name added to the picture of the building, implying that it was a Gruen or Rolex owned factory depending on which advert you saw. When Rolex and Gruen were both shareholders in Aegler, the the two companies sold Aegler watches in their respective territories. Rolex had Europe, Asia and the British Empire, whilst the Gruen brothers sold Aegler watches in the US only. From 1927 to 1929 George T. Gruen was trained at Aegler. Gruen were a watch manufacturer in their own right, as well as buying movements from Aegler. During the Great Depression of the 1930s Gruen's sales of watches in the USA plummeted. Gruen ceased buying in movements from other Swiss manufacturers and made all their Swiss movements in their own factory in Biel/Bienne called the Gruen Precision Factory, which they had built in 1922. Aegler agreed to supply all the movements they made to Rolex and in exchange the trading name was changed to Aegler S.A. Rolex Watch Co., although the company remained owned by the Aegler and Borer families and the legal name remained Aegler S.A. With this arrangement the agreement between Gruen and Rolex lapsed and Rolex were able to sell watches in the USA. When the Gruen Precision Factory was sold in 1977 the building was acquired by Aegler S.A.